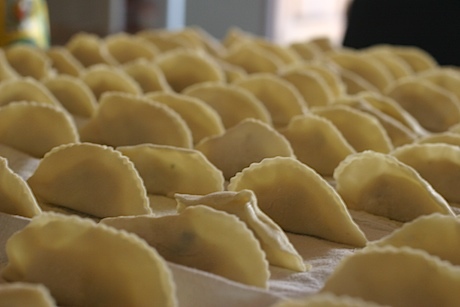 Today was a marathon pasta making day, over a kilo of farfalle (bowtie) pasta and another kilo of “Culurgionis di Patate”. That’s a Sardinian ravioli that’s filled with potato, 3 kinds of cheese (parmigania, pecorina fresca, pecorino staginato), butter and sage. What could be wrong with that? The only thing wrong is that they slide down the gullet way too easy. Taps right into my Polish roots as it sort of tastes like a pierogi, only it’s got that sage thing going on. 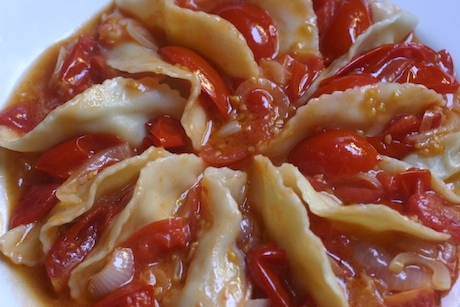 We had to have a few for lunch, sauced very simply: fresh cut tomatoes, a little chopped onion, simmered in a bit of butter and olive oil. Yum.